Larson Electronics LLC, a leading industrial lighting company, announced the release of a new tripod mounted dual LED work light to be added to its catalog of products this week. This dual LED work light features two LED light heads connected together and mounted on a lightweight aluminum tripod for easy portability. This LED work light comes mounted on a sturdy, lightweight aluminum tripod and offers the same amount of power and durability as our standard line of LED light towers at a much more affordable price. The WAL-TP.S-2X25WRE-25-1227 tripod mounted dual LED work light features two of the Larson Electronics LLC LED25WRE-CPR LED spotlights that provide 2,750 lumens of light each while drawing less than 2.25 amps from a 12 volt electrical system. These LED lights are waterproof up to 3 meters, sealed against intrusions by dust and dirt and are constructed to withstand demanding environments, conditions and applications. This dual LED work light features an inline power supply that draws current from the power source and then steps it down to 12V to run the lights. 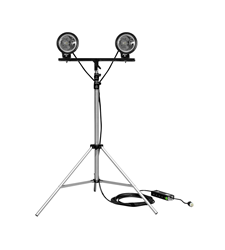 Each of these LED light heads are mounted on an adjustable aluminum tripod that can reach heights of up to 10' and be lowered to 3.5 feet for applications where a lower height is required or for storage and transportation. A single mounting bracket holds the dual LED light heads and allows them to be adjusted and aimed horizontally and vertically. This allows users to expand the area covered or to focus more intense coverage on a smaller area. The tripod legs can be collapsed and the light head bracket removed with the light still on it for simple portability and deployment. This general use tripod mounted LED work light is equipped with 25' of 16/3 chemical and abrasion resistant SOOW cord between the power supply and the light heads, and an additional 1' of cord between the power supply and cord cap that is fitted with an industrial grade cord cap for easy connection to common wall outlets. Plug options for this LED work light offer worldwide compatibility. "If you are looking for a light with maximum power at an affordable price then this LED work light is for you," said Rob Bresnahan, CEO of Larson Electronics LLC." This LED work light comes mounted on a sturdy, lightweight aluminum tripod and offers the same amount of power and durability as our standard line of LED light towers at a much more affordable price."